Unless you are a diehard fan of original LP covers, or Lorin Maazel's mid-twenties mugshots, I doubt that you will find the "Original Jacket" concept all that appealing. Sony Classical at least gives us both original sides when they do this kind of thing, but no such luck here. Veteran collectors might remember that many of these discs were released in DG's valuable – but short-lived – Original Masters series. That box held the Berlin Philharmonic material, as well as the orchestral music with the Orchestre National de la Radiodiffusion-Télévision Française. This box adds the Berlin Radio Symphony sessions, spread quite needlessly over 18 discs in a too-large box. Now that my complaints are out of the way, it must be said that this set has some very important recordings within. Maazel's career on disc spanned an astounding 50-plus years, held associations with nearly all the major labels, and with many of the world's great orchestras. He was not a sentimental man; poor health basically ruined his planned returns to Cleveland and Berlin after long, generally unhappy absences. So we should all be thankful that we have what we do, and in generally good sound. Almost all of these pieces are major works. Nearly every piece is in stereo. This is a true tribute to a great artist, even if I'm not entirely certain what makes certain recordings "early", or why we couldn't have just had a complete DG Maazel Edition. The early "Roméo" themed discs (they'd do this with Ozawa years later) are mostly excellent. The Berlin Philharmonic was not an ideal ensemble for Prokofieff at this point, and the selection from the Suites is rather obviously constricted by LP timings of the day. But the Berlioz is really good, while the Tchaikovsky features a daringly slow introduction that turns explosive later. Originally released as a rather provincial looking two-disc LP set, the mono sound still holds up well. His later Tchaikovsky Fourth with the Philharmonic is equally fine. 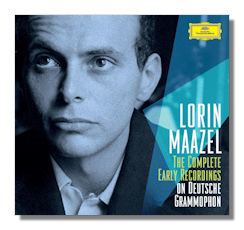 Maazel recorded the work again for both Sony and Telarc, and neither effort matches this one. The other Prokofieff in this set features the Orchestre National de la Radiodiffusion-Télévision Française in an English reading of Peter and the Wolf. Alec Clunes voice is way too big, and I prefer a more whimsical account of the tale. Still, it does show Maazel having a bit of fun. Unfortunately, Maazel is a simply strange sounding narrator in the Britten. He's obviously trying to engage children, or something to that effect. But that was never his gift, either as artist or man, and he sounds a little scary. You may disagree on that last count, but I think most of us can agree that the music sounds much better without narration in the first place. This is Maazel's own text with the approval of the composer; I will let you decide what you think. The Stravinsky with the Berlin Radio Symphony Orchestra is intense and totally convincing, though some have found it lacking in subtlety. The other selections with this orchestra are somewhat less impressive. Maazel's Falla finds little of the color of a Stokowski or a Markevitch, though I have no problem with Grace Bumbry in the ballet. On the other hand, the Franck D minor definitely benefits from Maazel's lack of sentimentality and directness of expression. There is another Franck Symphony from Maazel, though it is presently only available in Maazel's "Cleveland Years" Decca box, or as an import from Australian Eloquence. The present version was last seen on DG's Originals line. The Ravel operas are classic accounts that are also on DG Originals, as well as within Decca's supposedly complete Ravel Edition. The Mozart Symphonies first appeared on disc within the context of the Original Masters box, and don't get an original cover. Nor do they get especially important recordings, although it's sort of neat to see a soon-to-be major artist tackle K. 16. That leaves the rest of the Berlin Philharmonic sessions, and I am happy to report that nearly all of them represent Maazel's best showings in this music. Certainly he never did a better Beethoven Fifth and "Pastoral", which strike me as far more engaging than Karajan's efforts with the same orchestra from a few years later. We may never know why DG didn't complete Maazel's early Schubert cycle (though my money is on Karajan's ego), so what we do have is very good. These are crisp and cool readings, perhaps slightly deficient in warmth. They are much more interesting than the live accounts released recently on Bavarian Radio. Finally, the Mendelssohn is leagues ahead of Karajan's heavy and oily accounts on DG Originals. I can understand that direct comparisons between the two may show Karajan to have more tonal allure. But I vastly prefer Maazel's expressive range and tension. Only the Brahms is less than satisfying, Abbado and Karajan both did this music better. All in all, there is much to discover and enjoy here, and this set gets my strongest recommendation.